CROSSHAIR™ (Magnified Optics Simulator) is a unique, high fidelity training simulator for distance shooting and the use of long-range optics. By embedding micro displays in a variety of optics, we were able to enhance the capabilities of our training simulators offering snipers, marksman, and observers the ability to coordinate and execute tactical scenarios incorporating observation, cover and engagement. 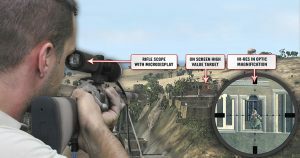 CROSSHAIR™ (Magnified Optics Simulator) utilizes customized scenarios that immerse shooters into a virtual environment where variables such as; wind, elevation, time of day and virtual combatants can be manipulated to offer the most realistic shooting experience possible. A comprehensive physics engine is able to replicate ballistic data and accurately simulate weapons characteristics for an array of standard issue firearms. 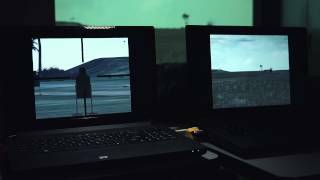 Furthermore, CROSSHAIR™ (Magnified Optics Simulator) reinforces target recognition, target acquisition, human movement, and adaptive reflexive thinking.